In 1971, I received a vision of the night in which I was shown a row of houses. It was not until 23 years later that the Spirit gave me a dream which held the key to the meaning of these houses. They represent presidential administrations, starting with Truman in 1953, and extending into the future for two more presidents (beyond Clinton). "We were fleeing the persecution and calamity of the day. A brother was fleeing with me. He fell and I paused to help him up. We prayed "Lord Have Mercy". My friend vanished, and I looked around to see that I was at the top of a hill overlooking 12 houses. As I looked to the west, I noticed dark and ominous clouds gathering over one house (#10) and proceeding through to the last house (#12). I looked into the sky over #12, and saw an arc of what appeared to be 6 stars in the sky. One of the stars fell to the earth like a fig that was shaken off a limb. A voice came to me and said "look to the east!". I began to turn to the east, fully expecting to see the Lord coming in the clouds. The dark clouds opened up in two places and I saw the sun darkened and the moon turned to blood. As I looked to the east, instead of seeing the Lord in the sky, I saw an army. This army was made up of ancient armliments such as battering rams, catapults and siege ramps. I ran down and joined the army at house #5. Instantly I was transported into the future, and found myself before what I can only call a "temple fortress". The city was gray, in ruins, and desolate. A man had just emerged from the huge double doors of the temple fortress. He was dressed in a suit. A voice said to me "he says he is god, but he is of devil". The the vision ended. 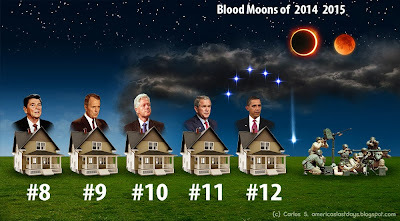 The 12th house represents President Barack Obama and his administration. This is only the beginning of events to occur during this time. This may not be the last president. After the year 2015 there will be a war in the east which he believes to be an army of believers in Christ but this may be a war in the middle east and Israel. 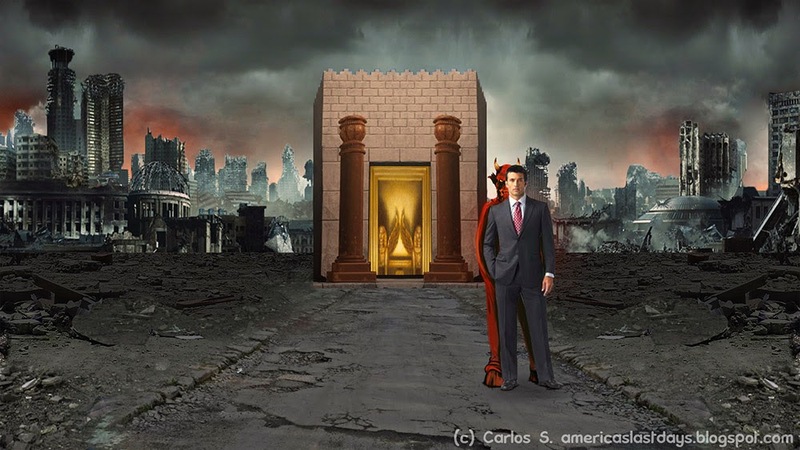 After this time he was taken to the future and shown a city of ruins and desolation in which he saw the antichrist rising from the temple proclaiming himself to be God. This is clearly the destruction of a nation which i assume is America. The Blood moons of 2014 and 2015 will begin a long series of events leading to the arrival of the antichrist within the coming years.